The floats are getting pre-staged for the parade. 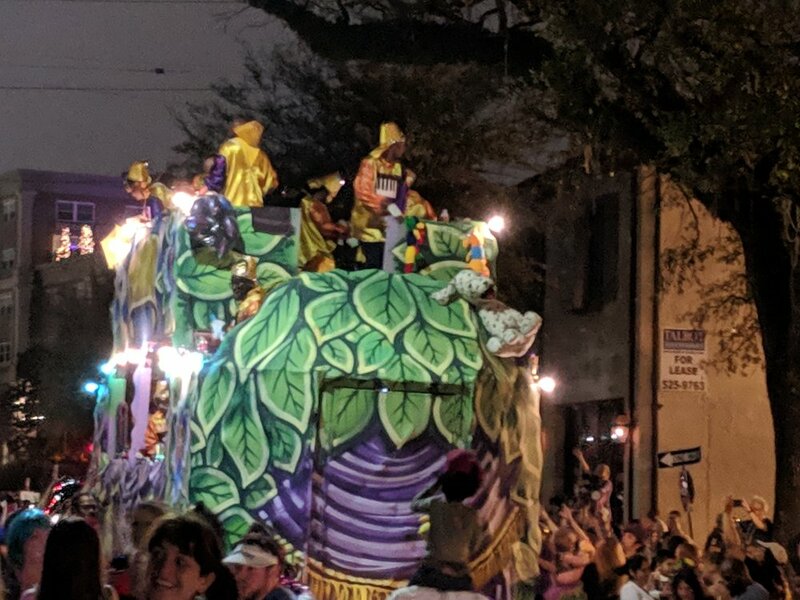 Imagine this: You’re clipped to the side of a Mardi Gras float with a three-foot harness (six-feet, if you’re on the second floor). Stacked all around you are bags and bags of beads, pendants, and toys, so while a meter-square area seems like it’s manageable (especially to an archaeologist—meter squares are our jam), there’s nearly no room. You even have to be careful of how you arrange your throws—some are on hooks on the railing in front of you, some are hanging from hooks in the ceiling—and you need to keep spaces clear so others can get safely loaded onto the float—some of the chains I bought could have taken your teeth out, if you’d walked into them the wrong way. After the door is shut, you can arrange things to be a bit more comfortable. The riders on the top of this float indicate that they have their harnesses ready to wear. Beads are staged and ready to be thrown. You plan bathroom breaks carefully, going when you can before you get rolling, and using the porta-potty on the float when you must. I’ve used porta-potties all through my archaeological career, but this was new, going while moving, when you can see the road passing beneath you. It’s every bit as glamorous as you imagine. I loved my throws. Riders pick them because they want to make someone else happy with them. Everyone in the Krewe buys their own throws. I went a little crazy, because I love shiny things, but they all got tossed. There were pallets of bags of beads being loaded onto the floats before we left. 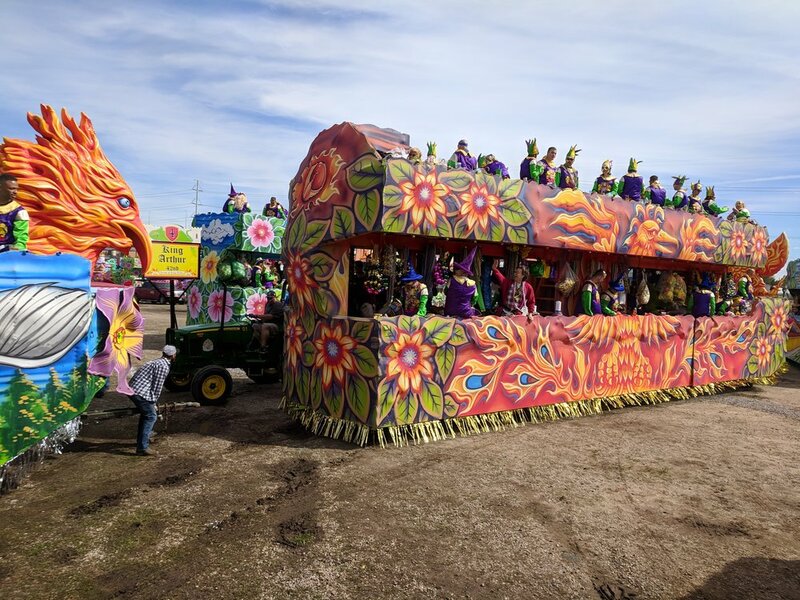 Preparing for the parade was exactly like launching a military maneuver: everyone had to be in the correct position, all the riders had to have their harnesses and masks on, and there was a lot of camaraderie, and sharing of mimosas and snacks. My fellow riders: Jude, Bryan, and Erica in back. I rode with The Krewe of King Arthur. There were about fifty floats and 1600 people in our parade, the seventh largest to ride in Mardi Gras. We rode on Family Sunday, and it was really a family event, much like a block party. The route is about five miles long, and the weather was perfect (having been soaked by a torrential downpour the night before, we’d earned it). The theme was “And The Arthur Goes To...” because it was Oscar Night as well. Our float had a pinata, so we were called “Coco,” after the animated film. 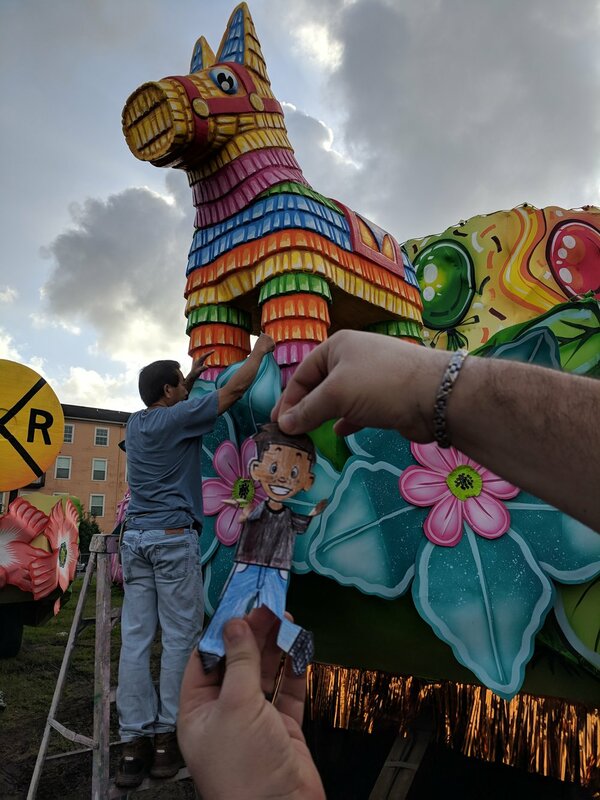 “Coco” was our float; Flat Stanley was visiting from Massachusetts. I really loved the masks we had on our lieutenants’ floats. I thought it would be harder to connect with people in the crowd, but oddly, it didn’t. And connecting is the key—I asked how you know who to throw to, and the answers generally boiled down to you like someone’s t-shirt. You like the little shimmy they’re doing to get your attention. You think someone is cute. You make eye contact, and then throw the beads to them. If it’s something special, you make sure to point to them, so that others won’t try and steal their prize away. Our tunics mark us as Krewe of King Arthur; our masks tell you who’s in charge of our particular floats. It’s a bit overwhelming: you have a DJ on the float, you can hear the music from the bands and the other floats around you, and the crowds are screaming. People hold up there kids, which can be disturbing when you suddenly see a toddler’s head eight feet off the ground. You dance around and dangle trinkets to see who will make the most effort to get one. Bryan gave me a grail (one of the most sought-after throws) to toss to someone: I chose a little girl whose face absolutely radiated surprise and delight when she saw it. And despite feeling exhausted after the parade, it was exactly as glamorous as you imagine. And then we all went home, ordered pizza, and collapsed to watch the Oscars. A few strands of beads, just for a souvenir, I thought. I don’t need more than that. My resolution fades in a heartbeat, I’m caught up in the frenzy, yelling and waving to the riders on the Mardi Gras floats, trying to catch coins, cups, toys, and ropes of shiny, shiny beads. All I can think is: It’s all about the competition with those around me. It’s participation in an event that has almost mythic dimensions. My anthropological mind is coming up with analytical answers, but they’re only rationalizations. I want the damn beads! I’m not actually throwing elbows, but my friends and I sheepishly admit, we’re in it to win it. It’s my first Mardi Gras parade, and I’m already caught up in it. Kids get great views…and parents hold their kids up to the floats to try to get good throws. My mistaken notions were quickly dispelled. Most of Mardi Gras—the local Mardi Gras— is a family celebration, a block-party atmosphere. There is etiquette (how close you set up next to the people next to you on the parade route, you don’t run after throws obviously intended for someone else) and there are laws (riders must be masked while visible on the float or risk a fine, no obvious drunkenness). The Krewe parades had floats as well as local high school marching bands and dance troupes. Watching them dance and perform over a route that is miles long is impressive, and even more so when you’re watching them in a downpour. You clap all the harder, knowing you’re sitting at the mid-point of the parade, and they have a long, drenched and shivery way to go. Of course, it’s worth it to watch parades in the pouring rain. Those more fainthearted leave, and you’re likely to get much better throws. Not that I needed them...but I wanted them. It’s part of the experience. Doubloons, krewe pendants, and a pig…from The Krewe of Pygmalion, of course. I was really happy with the throws I caught during my first parades. Plenty of basic beads, a handful of doubloons (coins marked with the stamp of the Krewe, a new design every year), krewe specific toys and pendants, and a grail. Every krewe decorates grails to hand out to parade watchers who make an especial impression. There is even a “grail of grails” handed out by the royalty of the krewe to an especially impressive onlooker. I think it was the mask that I made that got me a grail from the Krewe of Cleopatra. I figured I’d make a mask, and it was fun, if hard to keep on over my glasses. It’s an opportunity to celebrate community, eat good food, and share the event with friends. I fell in love with Mardi Gras, and this was even before I rode with The Krewe of King Arthur. Archaeologists and werewolves have a lot in common, even beyond the way that both groups have a reputation for tearing through the underbrush, and doing inscrutable activities that confuse and concern the neighbors. Both groups have rules. In older movies and fiction, werewolves generally were depicted as loners, only constrained by the state of the moon and metallic silver. More recently, werewolves have been written as living within the hierarchy of the pack, with alphas, betas, and all the strict, sometimes harsh, traditions of any culture. This is certainly the case with Rhiannon Held’s werewolf packs, divided into regions, and bound by rules of courtesy, history, and strength. These days, werewolves can’t just go running around, doing whatever they want. Lady’s Children is out today! And neither can archaeologists. Popular representations would have you believe that we go wherever we want, pillage whatever treasure is the current object of our obsession (and it’s always obsession, in fiction—seldom the adventure of scientific inquiry with its rigorous application of methodology), and then either save the world from an unspeakable doom or sell the artifact to save (fill in the blank). 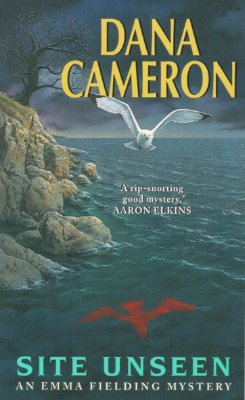 If you’ve read my Fangborn books or my Emma Fielding books, you know my take on it: It just ain’t so. Rhiannon Held is also an archaeologist, and she brings her expertise to bear in her new collection of urban fantasy/werewolf stories. One of the fun things in Rhiannon’s latest collection, Lady’s Children (stories from the world of Silver) is to watch a werewolf pack deal with the frustration of archaeology’s real-life rules when they ask human archaeologist Faith to examine a property to determine whether werewolves lived there long ago. In “Contested History,” Faith has to explain to them that there are legal restrictions on what she can do at her level of expertise, and how carefully they must work—the rules of her scientific “pack.” Yes, she explains, we look for artifacts, but if we don’t record exactly where they were found, and with what, we won’t get the answers we’re looking for. It’s the information, with the artifacts, that tell the whole story. Faith encounters all of the problems of a contract archaeologist: dealing with the landowners, working with a demanding (and carnivorous) set of employers, and struggling with an inexperienced crew, new to the dirt and tedium and personnel conflicts--just like real archaeology. There are significant pay-offs in each group learning the other’s culture—and I won’t give any spoilers—but they are as real and subtle as any real-life excavation. You don’t always find what you expect, but you need to be open to all the interpretations suggested by the data. Even if you’re a werewolf. Okay, most every vacation I take is going to feature some kind of archaeological content; you can take the girl out of the field, but… This year’s vacation featured loads of prehistory and archaeology, from the northwestern European Neolithic to the Viking period. Mr. G and I have always wanted to visit Viking period sites in Ireland, Britain, and Scandinavia by water, and this was chance to do it. Glencoe, Scotland, which was lovely even when it started raining. This is right before. We started in Dublin, to visit friends and revisit a city we haven’t seen in twenty years. The highlights for me were the National Museum of Ireland (for the prehistoric and Viking collections) and the Chester Beatty Library (if you have any interest in the history of books or writing, this is one of the most amazing collections in the world. I’m not exaggerating.). From there, we flew to Glasgow, where we met up with our tour. First, through the Highlands, where the weather promptly turned Highland-y, that is, wet and cold. We took The Jacobite, a steam engine, from Fort William to Mallaig, and I’m told the scenery was gorgeous—it was cloudy and rainy, and we could only see bits. What was really cool was that, being a Sherlockian, it was great fun to travel as Holmes and Watson would have. Getting genuine train soot in my eye was less fun, but very period-accurate. Okay, yes, it was also used as the "Hogwarts Express." From Mallaig, we cruised to Orkney (Mainland). This for me was one of the big goals of the trip, because I’ve always wanted to see Skara Brae, a Neolithic village site that is older than Stonehenge and the Pyramids, with the origin of the settlement dating to about 3180 BCE. It’s fascinating to see the adaptations to a place where the weather is brutal and wood is very scarce: the stone walls survive, and it’s conjectured that the roofs were made of hides. When we visited Turkey in 2011, we had the privilege of sailing on the Euphrates River, so it was fascinating to see one part of the world, where agriculture probably began, and an example of a settlement where agriculture caught on, millennia later. ...you can get an idea of what it was like to live here, from this reconstruction. Note the roof of hides. The Ring of Brodgar was nearby, a Neolithic henge (a circular ditch and mound) monument and stone circle, probably erected between 2,000 and 2,500 BCE. Twenty-seven of the original sixty stones are still standing. There’s a lot of archaeological work still to be done to discover whether there were standing stones in a center ring, whether there were wooden structures, etc. It was such a beautiful site; if we’d stayed any longer, I might have run away to join the crew working there! After we returned to the ship and set sail for Shetland, I set my alarm to wake up around two a.m., so that I could live Tweet during the premiere of “Site Unseen: An Emma Fielding Mystery.” Two in the morning isn’t really my cup of tea—is it anyone’s?—but thanks to a good satellite system, I was able to hang out with friends, readers, and viewers from the middle of the North Sea! Behind the scenes of "Site Unseen: An Emma Fielding Mystery"
One of the things that was important to me when I wrote the Emma Fielding mysteries was that I be as true as possible in describing the work of archaeologists. So many books and films (not just mysteries) use archaeology as an excuse to incorporate an exotic setting, obsessive characters, or a link with the fantastic: I bet you can name three movies right now where archaeologists “unleashed forces best left undisturbed.” Some notable exceptions to this include work by fellow archaeologists-turned-novelists Aaron Elkins and Elizabeth Peters. It's the crew talking about the shot of the units, but it looks like pretty much every dig ever! I think it’s the same in filmmaking, where the popular perception is shaped by notions of glamour and fame, but from what I saw when I visited the set of “Site Unseen,” there were many more similarities to archaeology than I expected. I saw this in the minute attention to detail, the inventories of props and equipment, the planning that includes every shot the director wants plus contingency plans in case of bad weather, the individual tool kits of each crewmember, the discussions about the script, and a thousand other things (including feeding and moving a huge number of people). Victoria Harbor. British Columbia is one of my favorite places on earth! Each scene took a tremendous amount of time to shoot, but it was fascinating and I loved every minute of being on the set. Frankly, if I’d stayed any longer, I would have wanted to start shadowing the crew, to learn their jobs. Here are a few shots from my trip out to the set in Victoria, B.C. The fact the movie didn't really hit me until I saw the Maine state flag and the U.S. flag over this Island municipal building! I knew something was up, then. Both days, I got copies of the sides and watched filming from video village. The set from a distance. They knew they had it right when people started talking about the dig taking place on the beach! Working on the lighting for Emma and her crew. Hello, transit, old friend! The site tents were also great hiding places for cameras and crew. On set with Courtney Thorne-Smith. It was a pleasure to watch Doug Barr, the director, at work. Warming up with tea at the Empress Hotel after the set visit. The cakes didn't last long. Countdown to "Site Unseen: An Emma Fielding Mystery:" Throw a viewing party! Just three days to go! “Site Unseen: An Emma Fielding Mystery" premieres this Sunday, June 4, 9/8c on Hallmark Movies & Mysteries! As promised, I've made some suggestions for throwing a viewing party. Make sure there are plenty of seats for everyone—pillows on the floor work, too!—with a good view of the television screen! Provide food that isn’t too difficult to eat picnic-style and set it up in easily-accessible places. Have plenty of soft-drinks and water on hand. I chose several menu suggestions that would fit the characters in Site Unseen. These fun cakes from Digventures.com probably should be saved for the after party. Untenured Professor: Emma might let loose and order take out for a special occasion. But something healthy because adults now, but not salad or tacos—too messy to eat on the floor. Craft beer, or inexpensive bourbon, for drinks. Senior Faculty/Civilians: Pauline had pretty awesome taste and a budget to match. I think she’d choose a really gorgeous wine, to evoke thoughts about sun and soil and passing time. It's always an option do a variation on these foodie themes. 1. Find a friend with cable, and offer to bring treats! 2. Sling TV is a good option to stream the Hallmark Channel online without cable TV. Countdown to "Site Unseen: An Emma Fielding Mystery:" Who is Emma Fielding? Howdy! I’m starting a series of blogs to count down to the premiere of “Site Unseen: An Emma Fielding Mystery” on Hallmark Movies and Mysteries (June 4, 9-11pm). So I’m starting off with the basics: who is Emma Fielding? Emma is an an archaeologist, and the protagonist of my first six mysteries—Site Unseen, Grave Consequences, Past Malice, A Fugitive Truth, More Bitter Than Death, and Ashes and Bones. She got her name while I was writing my first mystery, and I happened to glance over at my bookcase. There I saw a copy of Tom Jones, by Henry Fielding, and a copy of Emma, by Jane Austen, and I put the two names together. It wasn’t for a long time that I realized how appropriate that name was—it can be read as a play on words for her job, someone who spends time in the field. I had another character point out the joke to Emma in a later book, but I felt pretty silly for not having seen it myself right away! Courtney Thorne-Smith on the set of "Site Unseen." I think she'll make a great Emma Fielding! And when I suddenly realized I was going to start writing a mystery (more about that in a future blog), I needed to figure out who my hero was. Since my career at the time was in American historical archaeology (studying the past through archaeology and first-person documents, like diaries or wills), that’s what Emma does, too. This turned out to be a real benefit for an amateur sleuth, because archaeologists need many of the same skills as detectives (which I’ll also discuss in another blog). I get asked a lot if Emma is based on me. That’s a tricky question, because while her adventures are based loosely on my own experiences (very loosely—my life isn’t that exciting! ), we have a lot in common. We both are academics and love puzzles; we’re both New Englanders to the bone. She’s a little more serious than I am, and she probably wouldn’t know what to make of my geeky sense of humor. On the other hand, Emma actually got me to start jogging; the great thing about a fictional character is that Emma’s knees won’t ever give out from all the fieldwork! 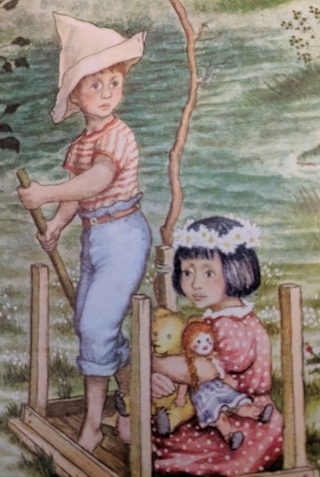 Emma is braver than I am—she actually surprised me a number of times, by running toward trouble when I expected her to quite sensibly hide—but then, she never tried to write a novel. She’s very loyal to her friends and her family, and she never gives up on a challenge. She’s passionate about what we can learn through science, history, and archaeology—and so am I.